Nestled in the upscale area of Umalas, the 2 Bedrooms vacation rental is a modern-concept villa that features thoughtful amenities. The hand-picked decor fits perfectly to fill the spacious living area and dining with a touch of Balinese accent to bring comfort and delight throughout your stay. 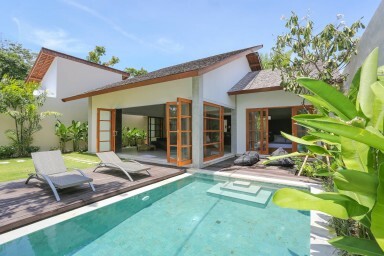 This villa is situated with only 5 minutes to the nearest beach such as batu belig and Petitenget, the famous Canggu Club can also be reached within 5 minutes. While it only takes 10 minutes to reach Seminyak and boutique shops with numerous restaurants, not to mentions cool spots for drinks such as: Ku De Ta, Hu'u bar, The living room, Potato Head and The Backyard Lounge. Our friendly staff will be ready to cater our guests every need discreetly and with the utmost care.